Amy Callahan Honored for Housing Women - CARITAS - Shelter. Jobs. Recovery. Hope. At the time, Amy was a recent graduate from Jame Madison University. She began helping CARITAS Shelter clients connect to resources in the community including housing, medical care, and workforce development. Within three months, Amy accepted the full-time position as the Women’s Program Manager. Since 2015, she’s become an energetic and effective member of the CARITAS team. “I knew I felt passionate about working with women and I still feel that way,” Amy said. In 2017, Amy connected 116 women to positive housing outcomes during their stay in the CARITAS Shelter. Homeward honored her efforts during the nonprofit’s annual Best Practices Conference. Amy received the Most Housing Matches award. 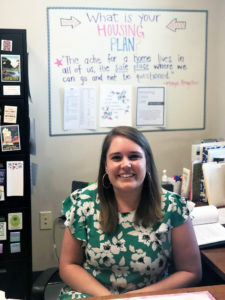 Her work to connect clients to housing and other resources is a part of a regional effort of the Greater Richmond Continuum of Care. CARITAS works with 20+ other organizations in Richmond to set policies, track homeless individuals, and ensure individuals and families in Richmond are receiving access to emergency shelter, transitional housing, and permanent supportive housing. Case managers like Amy follow a Housing First model that prioritizes providing people experiencing homelessness with permanent housing as quickly as possible while also providing voluntary supportive services. Amy connects shelter guests to workforce development centers, behavioral health resources, social services agencies and more. Ultimately, she says, she helps clients break down their barriers to housing and build a foundation that will allow them to afford housing permanently. Securing housing provides so much more to clients than a roof over their heads. When they’ve made it to housing, they can focus on building a career, recovering from the stress and trauma of their housing crisis, cook and eat healthy meals, nurture their families and focus on long-term goals. “We need to celebrate these housing placements more,” Amy said. We’re fortunate to call Amy a member of our team! Learn more about the CARITAS Shelter.